Henderson and Berla (1994) in an article A New generation of Evidence, state that the family is critical to student achievement. When parents are involved in school, children go farther in school and the schools they go to are better. There is a strong correlation between parental involvement and increased academic achievement. In the 1980s, the United States became particularly concerned with the quality of its educational system. Parental involvement in schools became a major issue. Communities also become more watchful of the expense of public education, while local schools became concerned with continuous provision of high-quality teaching and other services. All of this occurred in a time of dwindling resources. Additionally, parents wanted assurance that their children were receiving preparation adequate to lead rewarding adult lives (Kathleen & Karen, 1989). Riley (as cited in Moles, 2000) explained that “parents are the essential link in improving American education, and schools simply have to do a better job of reaching out to them” (p. vii). Parental expectations regarding their children appear to be a constant in children’s academic achievement and social adjustment. Although many parents may not be certain how to help their children with assignments, with guidance and support they can become actively involved in home learning activities, have an opportunity to teach, be models, and guide their children (Michigan Department of Education, 2001). He became interested in how schools in the U.S. involve parents in the education of their children because of the situation in my home country, Cameroon. During his education in Africa, I observed that students whose parents were not involved in their education did not perform well. Many dropped out of school or failed to further their education. 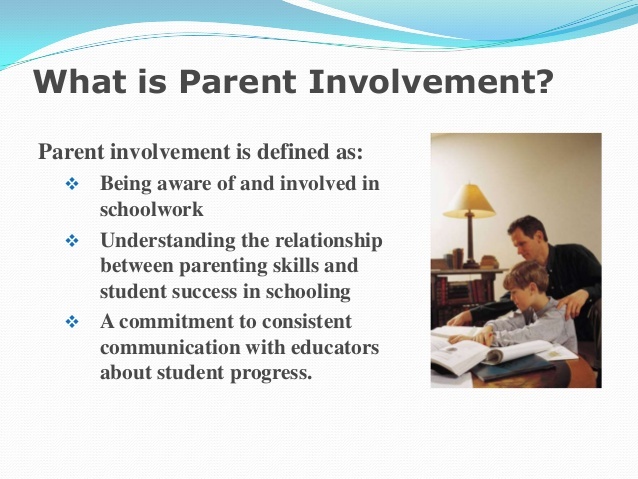 In the United States, parental involvement is discussed as a major focus. That is not the case in Cameroon. There, parents have little voice in pedagogy and content. According to Keane (2007), parental involvement improves the chances of children’s success at school, yet research suggests that parent participation may be on the decline. Keane further asserted that student achievement represents more than just grades. Attendance, students’ attitudes toward school, student behavior, and the drop-out rate all connect with student achievement. A report conducted by Desforges and Abouchaar (2003), showed that enhanced parental involvement leads to better academic performance, better attendance, and improved behavior at home and school (p. 44). In the post-World War II Era (1945-1950s), parental involvement included participation in parent conferences, monitoring of homework, signing of report cards, attending PTA meetings, and fundraising events. In the 1960s educators and policy makers focused on parental involvement as a way to improve educational success for the poor and underachieving students. This led to the development of a variety of models and strategies to promote such parental involvement (Milbrey & Shields, 1987). In 1965, Haiman began experimenting with parent involvement program strategies. He designed and wrote the Parental Involvement Performance Standards for the National Head Start and this was used as a consultant to Head Start throughout the nation (Haiman, 1965). In 1968 he spoke on the relevance of curriculum, administration and community involvement (Chicago Tribune, 1968). By 1979, many schools had started incorporating parental involvement into their school programs. Parental involvement in special education programs also increased (Los Angeles Times, 1979). By 1989, the National Education Organization had started incorporating parental involvement programs in their agendas. They provided training to school staff and parents on parental involvement. The School Board Association produced sample school policies on parental involvement which they believed would make schools more secure and more likely, academic development would take place. Best practices and models to support parental involvement were developed. Many reports were written to recommend the necessity of parental involvement in school improvement (USA Today, 1989). In the 1990s, studies demonstrated that parental involvement could predict academic achievement. Parental involvement was considered an integral part of the school curriculum. The level of parental involvement was increased in most of the school districts across the nation (USA Today, 1990). Today, laws have been created to enforce parental involvement in schools including provisions of NCLB and School Accountability Teams. Movements for community control of education such as the education of low-income children, special education students, and English Language Learners have been developed to meet the needs of students. Districts focus on implementing strategies to promote parent, family, and community involvement (National Center for School Engagement, 2004). The Family Strengthening Policy Center (2004) established that states can develop a state-wide network to support teachers’ preparation for parental involvement, and also provide technical assistance to local districts and schools on how to get parents involved. School districts must have a written policy for administrative support and training for staff, parents and community members on parent involvement programs. The community should be able to advocate with state education agencies and school districts to promote widespread and effective parental involvement policies and practices. According to the U.S. Department of Education (1997) a sustained mutual collaboration, support, and participation of school staff and families are required for a successful school-family partnerships and children’s learning. Although the success of school family partnerships is difficult to reach, it is important to note that the benefits to children and their educational success depends on hard work required to sustain the school-family partnerships (Epstein, Coates, Salinas, Sanders, & Simon, 1997). In line with the mandates of NCLB, the New Mexico Public Education Department (NMPED) has developed statewide standards which establish expectations for all New Mexico public school students. These standards require every district in New Mexico to develop an Education Plan for Student Success (EPSS) — a long-range strategic plan to promote students’ success and continuous school improvement (Parents Searching Out, 2009). Parent involvement in learning activity is a strategy that was found by Epstein (1995) to increase the educational effectiveness of the time that parents and children spend together at home. Teachers and parents agree on the involvement of parents, seventy one percent of principals and fifty nine percent of teachers called it a priority based on research conducted by. Those schools whose parental involvement is strong provide a lot of benefit to the students. ” How Strong Communication Contributes to Student and School Success: Parent and Family Involvement” shows that improved parental involvement not only leads to academic achievement, but to better attendance and improved behavior at home and school as well. When school and home work together collaboratively, and using a competent approach to education, it can make a huge difference in student achievement. (Padgett 2006) The National School Public Relations Association (NSPRA) suggests that a formal policy be created. Lack of planning was seen as one of the most challenging aspects to more involvement. Walberg on “Families in Educational Productivity” states that there is no question that parent involvement represents an exceptionally powerful way of making schools more effective, and of dramatically enriching children’s experiences. Some research indicates that achievement among students in primary schools have identified theories and policies which play significant roles in parent involvement in education (Fan and Chen, 2001; Hill and Tyson, 2009). These theories and policies not only closed the education gap in terms of demographics they also maximize student potential. Parent involvement is so important that The No Child Left Behind Act (National PTA, 2006) is a Federal Policy that puts a mandate on parental involvement in education and family-school relations across primary school levels. However, despite the consensus about how important it is for family and school to work together across developmental stages, theories of parent involvement in education have been based on the primary school students in their context and do not focus on the changes that occur with middle school and early adolescent development (Hill and Taylor, 2004; Hill and Tyson, 2009). The Title 1 program is also a government mandated program developed to increase parent involvement and educational services for disadvantaged children. This program placed the emphasis on parental involvement as the primary means of improving the quality of education of low income children (Kim O. Yap and Enoki, 1995). One may ask the question why parents should become involved in their children’s literacy activities. The evidence about the benefits of parents being involved in their children’s education in general and literacy activities in particular is overwhelming. (Fan and Chen 2001) in their meta-analysis found that parental involvement positively affects academic performance. Feinstein & Symons, 1999 point out in their research that parental involvement leads to academic achievement. Epstein’s framework of six types of involvement are as follows: parenting which help all families establish home environments to support children as students; Communicating from home to school and school to home about school programs and student progress; Volunteering by organizing parent help and support. Learning at home by providing information and ideas from families about how to help students at home with homework and other curriculum-related activities; decisions and planning; Parents should be included in decision making; involve parent leaders and representatives; Collaborating with the community by identifying and integrating resources and services from the community to strengthen school programs, family practices, and student learning and development. Students value their education when they see the interest shown by their parents. Barge, & Loges (2003), highlight the fact that government supports parental involvement. According to Moosa, Karabenick, & Adam (2001), “â€¦the alliance between home and school has dramatically changed throughout the history of formal education, as have the roles and functions that parents and teachers are expected to fulfill” (p. 477). Throughout time, parents have been “portrayed as both friend and foe in the course of educational reform” (Callahan, Rademacher, & Hildreth, 1998). Historically, parental involvement wasn’t always a welcomed addition to the school community, and even today some view parent-school relations as a power struggle. Shaver and Walls, (1998) reported that some research found little to no effect of parental involvement on school achievement for middle age students. For the most part however, teachers and administrators welcome a helping hand in the overcrowded classrooms of the public schools and agree that parental involvement is one way to bridge reading comprehension gaps. Today, it is widely recognized that parents play an essential role in their children’s school life. Numerous types of parental involvement have been shown to develop cognitive growth and success in school (Shaver and Walls, 1998). Schools are working hand in hand with parents, Edwards, and Alldred (2000); describe parents and schools as policy makers with similar functions when it comes to children. Research indicates that there are positive academic outcomes stemming from parental involvement with benefits beginning in early childhood, throughout adolescence and beyond (Henderson and Mapp, 2002; Patrikakou, Weisberg, Redding, and Walberg, 2005). Shaver and Walls, (1998), are also in support, they point out that the connection between parents and school achievement is real. The Epstein case studies are another research that supports parent involvement. Epstein (2002), used the Comprehensive School Reform Model (CSR) demonstrates how collaborative work produces positive outcomes. These studies were conducted in certain states, in selected school within the school districts. Educators, parents and community partners worked collaboratively on action teams to plan the curriculum. The programs are evaluated before being implemented in order to assess how well the plans connected family and school-community involvement. Henderson and Berla (1994) in an article “A New generation of Evidence”, state that the family is critical to student achievement. When parents are involved in school, children go farther in school and the schools they go to are better. “Regardless of socioeconomic status or race, studies show a direct correlation between parental involvement and a child’s academic achievement (Williams 1992). It is well established that parental involvement is correlated with school achievement of both children and adolescents (Long, 2007). Primary school children gain greater academic, language, and social skills (Grolnick & Slowiaczek, 1994), primary school students have greater achievement and future aspirations (Eccles & Harold, 1993) and spend more time doing and completing homework (Epstein & Sanders, 2002). Research shows that parental involvement is more important to children’s academic success than their family’s socioeconomic status, race, ethnicity, or educational background (Amatea & West, 2007). Parental involvement can encourage children’s and adolescents’ achievement in many ways. One way that parents can contribute positively to their children’s education is to assist them with their academic work at home. Parents who read to their children, assist them with their homework, and provide tutoring using resources provided by teachers tend to do better in school than children whose parents do not assist their children (Izzo et al., 1999). Additionally, in a study conducted by Callahan, Rademacher and Hildreth (1998) on twenty-six lower to middle-class “at risk” sixth and seventh grade white students, students’ mathematics scores increased when parents became involved with assisting them at home. In the Callahan et al. study, parents were trained for duration of ten weeks on how to implement home-based self management and reinforcement strategies. Shaver and Walls (1998) conducted a similar parent training with seventy-four Title I students in second to eighth grade. Their study showed that regardless of gender or socioeconomic status of the child, parent involvement increased the scores of both mathematics and reading. Other parental involvement strategies that are said to assist children academically are for parents to have books, newspapers, and computers in their homes (Suizzo, 2007). This is not to say that just because there are books and newspapers in the home that children will read them; children do, however, fare better with their reading when there are books and computers in the home. Research shows that the level of parental involvement is associated with academic success. Children whose parents are actively involved in their schooling benefit better than children whose parents are passively involved. Specifically, if parents attend teacher conferences, accept phone calls from the school, and read and sign communications from the school, their children will benefit academically more than children whose parents do none of the above. Furthermore, children excel even more when their parents assist them at home with their homework, attend school sponsored events, and volunteer at their children’s schools (Suizzo, 2007). Children’s academic success also may be related to school-level parental involvement. Parental involvement can be defined as participation by a child’s mother and/or father, or legal guardian in a child’s education. Children who attend schools where there is a high level of parental involvement evidence greater achievement. School-level parental involvement seems to benefit children and adolescents academically and behaviorally by promoting information sharing and control over children’s behavior. Coleman (1990) asserted that children whose parents know each other promote school identification and success for their children. Broh (2000) also mentioned that students at school-level parental involvement schools were more likely to do their homework because completing their homework was considered the norm at these schools. 2.5 What is Parental Involvement? Parental involvement means different things to different people. A recent newsletter published by The Center for Comprehensive School Reform and Improvement (2006) explained that some people equate involvement to chaperoning field trips or volunteering for PTA committees while others define it as attending an open house or signing off on homework folders. National PTA (2006) described parental involvement as regular participation of parents, a two-way process, and meaningful communication involving student academic learning and other school activities. National PTA pays particular attentions to parents, who are economically disadvantaged, disabled, have limited English proficiency, have limited literacy, or are of any racial or ethnic minority background. Under National PTA, schools are required to do evaluation and design strategies for more effective parental involvement, and also to revise, if necessary, the parental involvement policies. It also places the responsibility for schools to be certain that parent involvement initiatives are properly developed and evaluated. Davies (1991) defined parental involvement from a shifting perspective. Restructuring the society, communities, and schools leads to the transformation of parental involvement. The following evolving definition illustrates this paradigm shift. Parental involvement shifts from “parent focus to family focus, family to community agencies, school to home/neighborhood setting, eager parents to hard-to reach families, teachers/administrators agendas to family priorities, and deficit view of urban families to emphasis on inherent strengths of families” (Davies, 1991). He further explained that even though non-traditional families are much more common nowadays than they were in the 1950s, alternative family structures are effective and should be recognized by the school. Liontos (1992) mentioned recent beliefs about parents and families that schools should consider when involving them in their children’s’ education: “1) All families have strengths, 2) parents can learn new techniques, 3) parents have important perspectives about their children, 4) most parents really care about their children, 5) cultural differences are both valid and valuable, and 6) many family forms exist and are legitimate” (pp. 30-31). Jesse (2009) noted that parental involvement has two independent components: parents as supporters and parents as active partners. This approach of parental involvement would be insufficient if schools make use of only one of these components. Parents can be active, yet not supportive of the education process and vice versa. He further indicated that parental involvement should take many forms. For example, parental involvement can be reading to children, volunteering at the school, collaborating on decision making committees, and advocating for children. Hewison and Tizard (1980) explained that parental involvement can be focused if the school addresses the following issues: a) define what is meant by parent involvement, b) define what the school means by parental involvement, c) provide examples of parents’ decision making roles, d) remove structural barriers, and e) identify who else has an interest in increasing the parents’ role in the school. Parents, teachers, and administrators should be equally responsible for the education of children. If schools want to truly ensure academic success of children, schools need to make sure that all educational planning passes through parents first (Patrikakou et al., Weissberg, 2005). According to the National Parent Teacher Association (NPTA), although parents often state that they would like to be more involved in their children’s education, they complain that they feel left out of decision-making at their children’s school. Frankly, some school personnel are not comfortable with the idea of having parents involved in more than the traditional fundraisers. These personnel feel that as long as parents stick to traditional fundraiser events, everything else will be okay. Shatkin & Gershberg (2007) and Seeley (1992) found that parental involvement at some schools is seen as a power struggle. When teachers believe that they are the primary person to handle a child’s education, then they create an unbalanced and unequal partnership. Nevertheless, at least theoretically, most teachers welcome the idea of parent involvement. According to a teachers’ perceptions study published by the National Parent Involvement Network, 83% of teachers wanted an increase in parental involvement at their schools, and 95% of inner city teachers felt that parental involvement was lacking (Funkhouser, Gonzales, & Moles, 1997). Many parental involvement strategies have been used in the past, but schools are still baffled by the lack of parental involvement at the secondary level (Christenson & Sheridan, 2001; Drake, 2000). Antiquated parental and family involvement strategies are often cited as a major problem in research. Schools that update their strategies to accommodate the characteristics of their community benefit more than those schools that only use a standard program (Drake, 2000). Other problems may be that most parental involvement strategies are aimed at helping middle class families (Crozier, 2001), focus mostly on primary schools, and do not place much emphasis on minority families. The increased diversity of students and their families presents an even greater challenge to schools and teachers (Lewis, 1992; Wanders et al., 2007). Teachers recognize the benefits of including parents, but consistently complain that parents do not assist in their children’s education (Lewis, 1992). Administrators and educators should not assume that parents automatically know how to involve themselves at school or home. Parents need to be taught how to effectively involve themselves in their children’s schooling. The assumption that every parent knows how to teach their children should be admonished. Parents are not teachers and need to be instructed on how to teach, assist, and encourage their children at home (Quigley, 2000). Ineffective instruction at home by a parent could hinder the academic progress of their children. The National PTA (2006) gave the following suggestions on how to involve parents: a) schools should host orientation sessions for parents on how to be involved, b) have an onsite family resource center, which will give parents access to materials on parenting, c) give parents handouts on curriculum information and teaching methods, d) encourage parents to volunteer in school and at school events, and e) invite parents to sit on committees to participate in school-decision making. Likewise, it should not be assumed that teachers automatically know how to effectively involve parents in the classroom and at home. Epstein (1985) pointed out that the majority of teachers have little to no training on how to involve parents in the classroom. Therefore, most teachers lack necessary skills and knowledge on how to effectively work with parents. Kesslar-Sklar and Baker (2000) found that teachers need guidance from school administrators and consultants such as school psychologists to communicate with parents. In-services and workshops could provide guidance on how to effectively engage parents. Parent engagement is important on all levels of school involvement; however, sometimes schools are confused on what is considered parent engagement or involvement. School administrators and teachers feel that parental involvement is important for the academic success of children, but sometimes the definition of what constitutes parent involvement is often misconstrued between parents and teachers. According to Epstein and Sanders (2002), there are six types of involvement: a) parenting- assist families with parenting and child-rearing skills, understanding child and adolescent development, and setting home conditions that support children as students at each age and grade level; b) communicating- communicate with families about school programs and student progress through effective school-to-home and home-to-school communications; c) volunteering improve recruitment, training, work, and schedules to involve families as volunteers and audiences at the school or in other locations to support students and school programs; d) learning at home- involve families with their children in learning activities at home, including homework and other curriculum-linked activities and decisions; e) decision making-include families as participants in school decisions, governance, and advocacy through PTA/PTO, school councils, committees, and other parent organizations; and f) collaborating with the community- coordinate resources and services for families, students, and the school with businesses, agencies, and other groups, and provide services to the community. Schools play an important role in assisting parents with the aforementioned strategies. When these strategies along with parents feeling welcome are in effect, children thrive academically and socially. If parents do not feel welcome at their child’s school, they are less likely to be involved (Constantino, 2003). 2.7 How do Schools Engage Parents? Hanke (2006) pointed out that lack of parental involvement is due to lack of helpful information to parents. Emails, phone, letters, newsletters and personal contacts can be made by schools to reach out to parents. If schools communicate with parents regularly and consistently using the various means, the gap between school and parental involvement will be reduced. Students’ expectations and achievement will increase if families show high levels of interest (National PTA, 1998). Six different areas of parental involvement are identified by Epstein et al., (1997): parenting, communicating, volunteering, learning at home, decision making, and collaborating with the community. Two types of communication exist (The Pacific Resources for Education and Learning, 2006). These two types include one-way (transmittal) and two-way communication. In one-way communication, the school disseminates information to parents on how they can help their children at home. Examples of this type of communication are newsletters and informational fliers. The two-way communication is considered much more interactive and perceived as a partnership between the school and families. Examples include surveys and questionnaires structured to collect informational data pertaining to students (The Pacific Resources for Education and Learning, 2006). Reenay and Vivian (2007) explained that even though the invention of new technologies has made it easier for schools to reach out to parents (through emails, cell phones and internet websites), the use of traditional methods in communication has been found to be an effective way for schools to communicate with parents, but this has been limited in use by schools because of time constraints. In addition, it has been assessed that the frequent use of mass communications (newsletters, calendars, letters and handbooks) by school educators has not been effective in changing student behaviors. However, as Jonson (1999) reported, many parents do not communicate with their children’s schools due to a vast number of reasons. For example, their concerns might not be heard or responded to promptly, or they are busy at work. Despite the fact that technology is a tool providing new channels for communication, studies have shown that parents and teachers find difficulty in using them or lack access to them (Weifeng & Jialing, 2007). According to the New Skills for New Schools (1997) teacher organizations acknowledge the need for teachers to develop skills to involve families in their children’s education. For example the National Board for Professional Teaching Standard integrated parental involvement as a separate standard into the Professional Teaching Certificate (National Board for Professional Teaching Standards, 1991). The aim of these organizations is to provide pre-service and in-service training to teachers on parental involvement. However, little is known about preparing teachers to work with families (New Skills for New Schools, 1997). The school exists in a society representing people in many walks of life, all of whom have passed through some form of schooling, be it formal or informal. Most people in the community have an interest in, and are willing to contribute to the success of children and their safety in school. The school receives input from the society (e.g., students, staff and resources) and, consequently, graduates students into professions addressing the needs of the society. Thus, it is an open system. It is, therefore, important that members of the community – parents, business companies, seniors, and stake holders – work in partnership with the school for the success of children. Specifically, parents have direct impact on their children’s progress in school. Zero Tolerance. A constructive way that school personnel could involve parents is to involve them in school policy issues. School policies such as Zero Tolerance, for example, could benefit from parent feedback and parent support. Initially, Zero Tolerance policies were set up in 1989 in three school districts (California, Kentucky, and New York) to punish students for drugs, fighting, and gang related activities. In 1993, schools across the country adopted the policy and eventually added smoking and school disruption to the policy (Skiba & Rausch, 2006). Zero Tolerance arose in response to the increase in violent interactions in some schools; murder, murder suicides, sexual assaults, and other violent crimes have increased in the media and concern for safety on school campuses has increased (National Association of School Psychologists (NASP), 2001). Urban schools and low income schools have seen an even greater increase in the adoption and implementation of Zero Tolerance policies with current Zero Tolerance policies targeting any behavior the district deems punishable. Schools that follow “Zero Tolerance” policies by suspending and expelling students for minor reasons are at a greater risk for having student’s dropout (Skiba & Rausch, 2006). The prompt to develop and strengthen zero tolerance policies have not gone unnoticed by mental health professionals and researchers. NASP has reviewed these zero tolerance policies and has condemned them to anyone who would listen. NASP (2001) disagrees with this policy because students who are often suspended or expelled because of the Zero Tolerance policies often drop out of school or become part of discriminatory practices. Ensuring that parents are a part of policy making decisions with Zero Tolerance policies and other pertinent school policies will help to keep students in school. When parents are a part of important school decision-making policies, they feel more of an ownership in maintaining the policy. When parents feel included, school climate improves and in turn, student’s achievement improves. Besides involving parents in school policies such as Zero Tolerance, obstacles prohibiting parents from becoming involved must first be fixed. Recently, numerous research findings show that students who have been retained in the ninth grade also are at a higher rate for dropping out of school. Grade Retention. Another policy issue that should be discussed with parents is that of grade retention versus social promotion. Recently, research findings show students who have been retained in the ninth grade also are at a higher rate for dropping out of school (Gewertz, 2007). Research shows that students transitioning from primary school to middle school to only get retained in the ninth grade are more likely to feel like an outcast. Most of these failing students view primary school completion as an unattainable goal. Some feel that if they cannot complete ninth grade, then they definitely cannot complete the following grades. Supportive staff and faculty at primary schools geared towards assisting students at-risk of failing the ninth grade could definitely assist in stopping students from dropping out of school. Making parents aware of transitional issues for ninth graders could also assist in keeping students on track. Schools could offer parents informational workshops or handouts at open house meetings on how to assist their children with the first year of primary school (Deslandes & Bertrand, 2005). Schools that have effective transition programs include parents when transitioning students (Phelan, Yu, & Davidson, 1994). Schools can start the transition process by providing information about the new school to the student and the parent. Schools can do this through tours of the school, small-group sessions with counselors, and newsletters and websites that provide information to parents and students. Schools can further include parents with transitioning by using existing 9th grade parents to serve as ambassadors for providing information to new 9th grade parents (Paulson, 1994). Wandersman et al. (2002) found that parents of all ethnic and diverse backgrounds want to participate and feel that it is important to participate in their children’s education. Although research shows that some parents are becoming more educated and want to do more than the traditional fundraiser, there are some parents who do not participate at all. Mostly, parents who do not participate at all in their children’s schooling come from the lower socioeconomic class and ethnic minority groups (Constantino, 2003). Although the U.S Census Bureau found a decrease in the white non-Hispanic population from 76% to 72% and an increase in the Hispanic population from 9% to 13% and the Black population from 12.3% to 12.9% (Constantino, 2003), parental involvement strategies still derive from the majority culture. Davies (1987) proposed that the majority of parental involvement strategies are biased towards the middle-class parent. Kaplan, Liu, and Kaplan (2000) found that parents are more likely to participate when they can communicate with same class personnel. Moles (1987) reinforced the idea of parents being comfortable with others from socioeconomic backgrounds similar to their own by portraying the typical involved parent as being female, white, high-income, and college-educated. Furthermore, Ingram et al. (2007) and Ramsburg (1998) found that parents who view education as part of parenting will be more involved than parents who do not view education as part of their role as parents. Parent involvement varies from school to school with lower income schools having a difficult time getting parents involved, especially at the secondary level. The National PTA (1998) cited three reasons for parents not participating: a) a lack of time due to employment, b) parents not making themselves available for involvement, and c) inability to obtain a babysitter. In a survey completed by the National PTA (1998), 52% of the parents polled reported that “time constraints” was the main reason for not participating at their children’s school; however, 91% of the parents agreed that parental involvement was important for academic success. Other studies have found similar responses relating to time and employment (e.g., Collins et al, 1995). Other reasons that parents don’t get involved with their children’s school include language barriers and previous horrible school experiences (Delgado, 2007; Finders & Lewis, 1994). With this in mind, Robertson (1998) reported that one way schools can accommodate day working parents is to hold night events. Antiquated methods of involving parents also play a role in how parents become involved at their children’s school. Epstein (1982) found that while schools used traditional methods of involving parents such as having parents volunteer in the classroom, they rarely used other methods that might work for increasing parental involvement. Methods better preferred by Epstein (1995b) are as follow: (a) help parents increase their child development knowledge; (b) encourage different types of parent involvement; (c) reach out to families through home visits, informal meeting settings, and written correspondence that the parent can understand; (d) communicate with parents using a variety of methods so that they could be kept abreast of their child’s progress; (e) accommodate parents work schedules when hosting school projects; (f) ensure school staff and faculty are accessible to parents; (g) reach out to families whose first language isn’t English by learning about their culture; (h) begin building relationships with parents at the opening conferences of the school year and continue this relationship by making parents comfortable at other teacher-parent conferences; (i) make parents comfortable by allowing them to visit the classroom and give feedback; (j) parent centers also should be established as a way for parents to gain knowledge; and (k) write a school policy statement that ensures a positive school climate for family involvement. At the secondary level, another reason why parents tend to drop off involvement is that the curriculum is more difficult and the students are wanting to be more independent (Collins et al., 1995; Ross, 2006). Some parents reported that they can no longer assist their children with completing their homework assignments due to their own skill limitations. Ballen and Moles (1994) countered this by advising that if parents monitor their children’s homework they can assist them with matriculation. Furthermore, helping secondary students make postsecondary decisions and assisting them to select courses that will support their postsecondary plans is also good. Also, parents should not forget to regularly correspond with their children’s school by contacting teachers, and reading and signing correspondence sent to them. The positives for being involved at the secondary level outweigh all the negatives of not being involved at all; while parents cited reasons that they could no longer assist secondary level children, research shows that any level of participation is better than none. Teachers and school administrators need to appreciate the customs and beliefs of culturally and linguistically diverse parents if they truly want them to be involved in their children’s schooling (Wandersman et al., 2002). Parental involvement has long been associated with increased academic achievement; it also has been correlated with a decrease in minority dropouts (Rumberger et al., 1990). Recently, literature has given even more power to parents by stating that parents play a major role in assisting their children with matriculation (Vaden-Kiernan & McManus, 2002-2003). Literature also has shown that teacher’s perceptions of minorities also play a role in minority children matriculating. Teachers must first reflect on their own values and attitudes and see if their attitudes are keeping them from developing a positive relationship with minority parents (Weaver, 2005). A strong partnership between teachers and minority parents contributes tremendously to minority children’s matriculation (Espinosa, 1995). Hispanics and African-Americans were more likely to dropout than Caucasians; the Hispanic dropout rate for the year 2003 was 23.5% and the African- American rate was 10.9%, while the dropout rate for Caucasians was 6.3% for the same year (National Center for Education Statistics, 2006). Steele (1992) found that the school achievement and retention rate gaps between African-American and Caucasian students have been persistent throughout history. If minorities continue to dropout of school, they will continue to make less, depend on the federal government for assistance, and have less positive outcomes overall. Epstein (1991) found that parents from all ethnicities care about the education of their children, yet parent involvement is often low for minority parents. The problem isn’t that minority parents aren’t interested in their children’s education; rather, they are unsure of what schools expect from them and how they might contribute at their children’s school. It is a lack of knowledge on how to participate that leads to low levels of minority parent involvement (Epstein, 1991). Sometimes barriers and stereotypes exist that prohibit parental involvement of minority parents (Moosa, Karabenick, & Adams, 2001). In an Arab-American study conducted by Moosa et al., they found that oftentimes teachers thought that Arab parents did not want to be a part of their parental involvement process, which usually entailed parents going to a parent training workshop. When polled, it was found that parents simply were not comfortable with the traditional parent training workshop. Instead, they preferred a one-on-one parent training workshop with the teacher. Arab-American parents felt uncomfortable because of their language proficiency, which they felt would be called into question in a larger setting. Similarly, one reason for why parents tend to drop off involvement at the secondary level identified by Collins et al. (1995) included the increased number of teachers to deal with and language barriers. Cultural and language differences hinder Hispanic parental involvement at schools; parents who do not speak English in their homes are least likely to participate in activities at their children’s schools (Koonce & Harper, 2005). Espinosa (1995) argued that successful involvement of Hispanic parents begins with understanding their culture and values. Failure to understand Hispanic parents’ values and culture may lead to negative outcomes for schools and students. For instance, Hispanic parents prefer face-to-face communication versus handwritten notes sent home by teachers. Additionally, American teachers traditionally prefer a structured parent conference, whereas Hispanic parents prefer a more relaxed conference setting. Failure to recognize simple cultural values could hinder the academic success of the Hispanic child and the involvement of the Hispanic parent (Inger, 1992). Martinez and Velazquez (2000) found that engaging migrant families in the school process is an added challenge to schools. Children of migrant workers have greater risks of failing in school than the non-transient child. To effectively involve migrant parents, schools should first understand their background and cultural beliefs, and then base involvement strategies around these beliefs. School activities that may assist with involving migrant workers may include providing transportation, refreshments at school activities, and evening and weekend events (Inger, 1992). In their research on School, Family and Community Partnership, Epstein et al., (1997) developed six types of parental involvement frameworks to help educators develop more comprehensive programs for school, family, and community partnerships. Although this framework may be used by schools as a guide, it is important to note that each school must choose practices that will help achieve its goals and meet the needs of its students and families. The six types of parental involvement framework include parenting, communication, volunteering, learning at home, decision making, and collaborating with the community (NMSA Research Summary, 2006). Epstein and her colleagues also emphasized the duty of the school in helping families establish home environments that will support children, design effective forms of home-school communication about students’ progress and school programs, and provide training and schedules that allow parents to get involved. Parents must be involved in the school decision-making process, governance, and advocacy through PTA/PTO, school councils committees, and other parent organizations. Schools have the responsibilities to work in partnership with businesses, agencies and other groups to coordinate resources and provide services to the school and the community (Epstein, Coates, Salinas, Sanders, & Simon, 1997). Parental involvement has always been a key component in Title 1 Law (Wayne, 2008). This law requires that each school develop and distribute to parents a written parental involvement policy they agreed upon. National PTA (2006) required districts receiving Title I funds to notify parents on their rights to get information from the school regarding the professional qualifications of the child’s classroom teacher and paraprofessionals. Extensive research has shown that student achievement increases when parents get involved (Harris et al, 1987). Teachers have acknowledged that priority be given in the public education policy to strengthen parents’ roles in the education of their children. Increase in parental involvement leads to an increase in academic achievement, better classroom behavior and conduct, greater self esteem, increased motivation and attitude towards school, low rate of absenteeism, increased school satisfaction, and increased school climate (Russell & Reece, 2000). Desforges and Abouchaar (2003) advised that parents should start getting involved in their children’s education from pre-school which can also make a positive difference at all levels, especially in the early years of school. In their study, Feinstein and Symons (1999) came up with the finding that parental involvement has been identified as a predictor for students’ achievement at the age of sixteen. Other studies have also shown that parental involvement of primary students is equally important. Epstein (1995) found that schools also affect parent involvement levels and evidence shows that parents want to become involved but are not allowed to have open communication with the school. Conventional avenues for involving parents in school can be closed to parents due to specific cultural knowledge. Parents have a lot of difficulty adapting to the school culture especially in non English speaking communities, but cultural knowledge is power and it can prevent parents from participating fully. The U.S. Department of Education (1997) research on parent involvement outlined three important aspects for children’s development and academic success. These include demonstrating attitudes, values, and interactions about learning through parenting; creating partnerships between schools and homes using two-way communication; and developing a sense of shared responsibility for learning outcomes by both schools and parents (Supreme Education Council, 2008). Henderson and Berla (1994) explained that when parents are involved in education, teachers build high expectations for students, and high expectations for parents’ opinions on their ability to help their children at home. As a result of parental involvement, parents develop more self-confidence and become motivated to advance their own education. Families are willing to support children’s learning to increase achievement and, thus, the school gets a better reputation from the community (National PTA, 1998). The New Skills for New Schools (1997) reported that research reviewing historical trends on parental involvement and student achievement has shown inconsistency in their findings and do not support the relationship. A number of studies have revealed that the benefits of family involvement are not restricted to student achievement but also include other factors based on educational accountability. For example, in Kentucky, the Prichard Committee for Academic Excellence provided parents and the community with information on specific components of school reform and informed them about their roles in implementing the education reform law. Sanders and Sheldon (2009) highlighted minimal resources parents acquire through social networks as one reason parents are less involved in their children’s education. Another is the educational level of the parents can present a barrier to the school involvement, Stevenson and Baker (1997). The parents with more education are actively involved in Parent Teacher Association meetings and conferences. The involvement decreases as the students move from primary to middle school because parents are less knowledgeable in some of the academic subjects. Eccles and Harold (1993) found that less educated parents shift their attention away from school because they feel inadequate to help their children with homework. It is believed by Lazar and Slostad (1999) that parents are willing to get involved in the education of their children, but the negative perceptions of parents persist because teacher education programs do not educate teachers to work with parents. Foster and Loven (1992) shared that the major explanation for this, according to researchers, is the fact that “very little attention is given to preparing teachers to work with parents and other adults” (Lazar & Slostad, 1999). Despite the importance attached to parental involvement, it is still being ignored in schools (The New Skills for Schools, 1997). According to Lazar and Slostad, (1999) “the way parents viewed their roles was shaped by the circumstances and norms of particular cultures” and “their beliefs about their own effectiveness as teachers or tutors” (p. 208). Major barriers to parental involvement in schools include the school environment, school culture, time constraint, changing demographics and employment patterns, and the lack of teacher preparation in involving parents in their children’s schooling (New Skills for Schools, 1997). In her study of school programs and teacher practice of parental involvement at inner-city primary and middle schools in 1991, Epstein found out that teachers had doubts whether they could motivate parents to become more involved even though they thought that parental involvement would improve students’ achievement. Teachers lack the attitudes, knowledge, skills, and strategies needed to collaborate with families leading to a weak school-family partnership (De Acosta, 1996). A report by the U.S. Department of Education (1997) indicated that 48 percent of principals who participated in a study believed that lack of staff training on parental involvement posed a barrier to parents’ involvement. The lack of preparation by teachers to involve parents in the education of their children remains a weakness in teacher education programs (Bredekamp, 1996).